Like any system you can make sure your display goes blank after a time or you can put your system ‘asleep’. 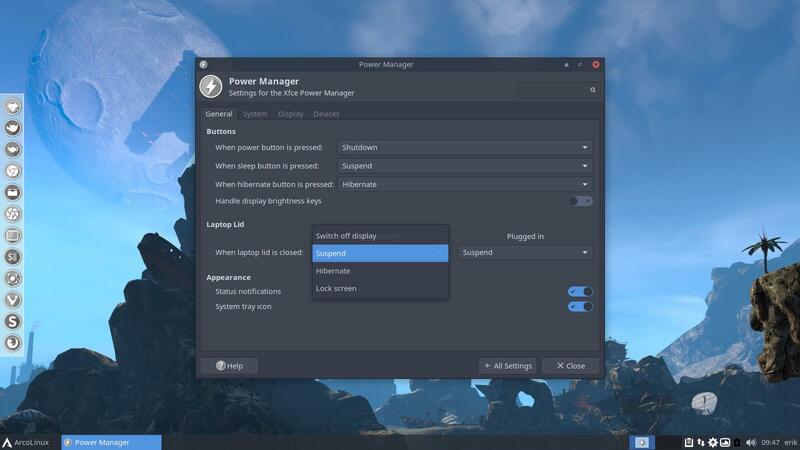 For all three desktops these settings are in the xfce4 settings manager, in Power Manager. The elements in there will be different if you are working on a laptop or on a desktop. With these settings I notice the computer is awake in a few seconds after a good night sleep if I press the power button first, then keyboard and then mouse. These are my personal settings for my laptop that I currently use. There is no guarantee these will work on your hardware. Test them out. These are my personal settings for my desktop that I currently use. Use your search engine to google for your specific needs of your laptop. Secondly check all articles on the Arch Wiki for your specific brand of laptop. Thirdly extend your search to youtube and blog articles.